Retired Gen. Keith Alexander, the longest-serving director of the National Security Agency and the first commander of the U.S. Cyber Command, will receive this year’s Intelligence and National Security Alliance William Oliver Baker Award for his extraordinary contributions to intelligence and national security affairs in the U.S.
Alexander will be recognized at INSA’s 35th William Oliver Baker Award Dinner on June 14 at the Omni Shoreham Hotel in D.C., according to a recent INSA news release. Past award recipients include Stephanie O’Sullivan (2018), former principal deputy director of national intelligence, and Robert S. Mueller III (2017). Alexander, who is currently the founder, chairman and co-CEO of IronNet Cybersecurity in Fulton, Maryland, has had quite the run in the U.S. intelligence and national security space. After a 40-year long career in the U.S. military, the retired four-star general jumped into serving as NSA director for 8.5 years. In this role, he was responsible for national foreign intelligence, combat support and U.S. national security information system protection. 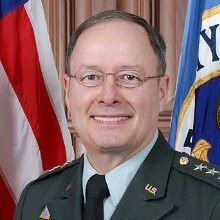 In 2010, Alexander took command of U.S. Cyber Command — leading efforts in planning, coordinating and conducting operations and defense of Defense Department computer networks and national cybersecurity defense. He retired from public service in March 2014. Prior to leading the Cyber Command and NSA, Alexander was deputy chief of staff for intelligence, G-2, for the Department of the Army; commanding general of the U.S. Army Intelligence and Security Command at Fort Belvoir, Virginia; director of intelligence for the United States Central Command at MacDill Air Force Base in Tampa, Florida; and commander of the 525th Military Intelligence Brigade at Fort Bragg, North Carolina.